Quick Connection Inflation Chuck Haltec 6190 / Bowes HT 6190. Designed specifically for use with 6185 check valve. 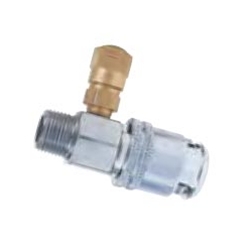 Sliding sleeve locks air chuck onto check valve and permits unrestricted air flow. Gauging can be done through valve on chuck. Positive air line shut off valve must be installed in back of air chuck.